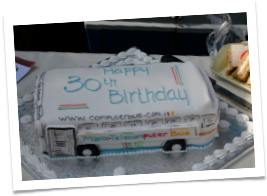 THE former Isle of Man National Transport bus Number 30 – now transformed into the Manx Telecomputer Bus – reaches its 30th birthday on Friday, April 27. A celebration is planned for noon that day, when the bus will be at the NSC, Douglas, as students from Ballakermeen High School learn ICT skills using the latest Apple iMac computer technology on board. Those associated with the bus during its passenger-carrying days, as well as officials from Manx Telecom and Protours, who sponsor its use in education, have been invited to attend. 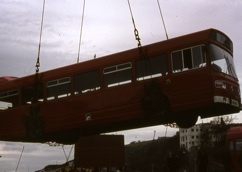 The brand new Leyland National bus – registration MAN 30N – was craned off the boat in Douglas on April 27, 1977, as part of a consignment of six ordered by Isle of Man National Transport General Manager William Lambden. Numbers 28 to 33 joined 14 similar buses already in service on the Island and were painted Isle of Man National Transport red. livery, complete with a side advertisement for Partington’s. By July 1987 many Isle of Man Transport buses had 'all-over' advertisements for Island companies and Number 30 was bedecked in an orange advert for EWDEC Communications. In October 1988, the bus was repainted again, becoming one of the first buses to receive the new orange and cream Isle of Man Transport livery introduced by new manager Robert Smith. A further repaint followed in the mid-1990s. On December 27, 1997, the Number 30 – by then the last Leyland National in service with Isle of Man Transport – operated a final enthusiasts’ trip around the Island, with Les Cannan, now Isle of Man Transport’s Traffic Manager, at the wheel. It was withdrawn from service and was replaced by Dennis Dart SLF EasyRider Number 30 (DMN 30R) – itself now withdrawn and sold to UK. The Department of Education purchased the vehicle in January 1998 and, that September, launched it as the Manx Telecomputer Bus following generous sponsorship from Manx Telecom and Tours Isle of Man (now Protours). In April 1999 the bus was used by US database giant Oracle to secretly trial 'Codename Scoop', later launched worldwide as Think.com. In June of that year, a dozen Year Nine students from St Ninian’s High School and Ballakermeen High School accompanied the bus when it was exhibited at London’s Earls Court in the BBC Tomorrow's World Live exhibition courtesy or Oracle. In June 2003 the bus was runner-up in both the Vodaphone e-Well Being Awards, presented in the Mayor of London's Suite, and the New Statesman New Media Awards, presented by UK Education Minister Charles Clarke MP. That September saw the original computers removed after five years’ faultless service and relocated for further use by St Ninian's High School. Twenty-three brand new G4 Apple iMacs were installed. October 2003 saw the bus nominated for an Isle of Man Newspapers and British Airways CitiExpress Pride in Mann award. 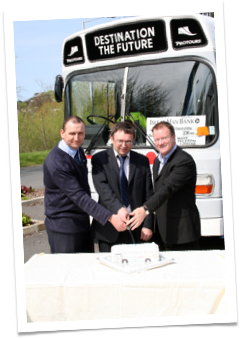 In July 2004 the bus was re-branded with new logos for sponsors Manx Telecom and Protours. Plans are afoot to refurbish and re-launch the bus this summer .